BANGKOK -- Two British tourists were found battered to death Monday on a beach on a scenic island in southern Thailand that is one of the country's most popular diving destinations. Police described the two as a 23-year-old woman from Great Yarmouth, Norfolk, and a 24-year-old man from Jersey, Channel Islands. 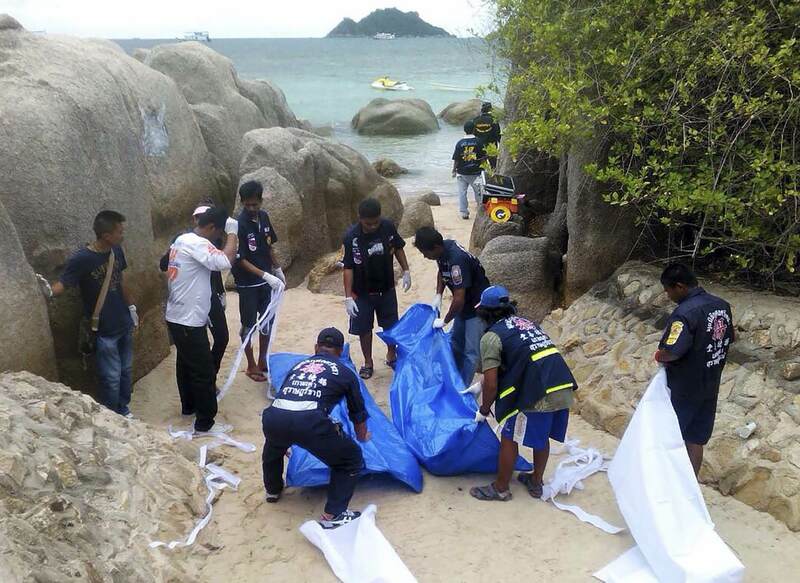 Their nearly naked bodies were discovered on Koh Tao, a small island in the Gulf of Thailand. A bloodied hoe was found near the bodies and is believed to have been used as the murder weapon, police Col. Prachum Ruangthong said. "The man was chopped in the back and on the side of his head, while the woman was chopped in her face," he said. "It's very gruesome." An initial investigation found that the two had traveled separately to Koh Tao, where they met while staying at the same seaside hotel, police Maj. Gen. Kiattipong Khawsamang said. "They went out to a bar and left together after 1 a.m. according to closed circuit TV camera footage," he said. Police said they had no immediate suspects and were checking more camera footage in search of the attacker. "We don't know who the suspect might be yet but we have talked to different witnesses who might lead us to some clues," Kiattipong said. He said the woman was traveling with three other friends. Local media reported that outraged residents of the island, which is home to about 2,000 people and survives on tourism, had blockaded its piers to help police prevent the killer from escaping. The attack came amid government efforts to revive Thailand's tourism industry after a military coup in May ended prolonged, sometimes violent political protests. Martial law remains in effect. Koh Tao, an island in Surat Thani province, is a quieter destination than the neighboring islands of Koh Samui and Koh Phangan, where "full moon" parties attract travelers from Thailand and abroad. It is 410 kilometers (250 miles) south of Bangkok.